With the end to the Draft, and the beginning of the all-volunteer U.S. Armed Forces, a new age dawned. Today the U.S. service member must score in the top 50% of their age group to join the Army and the top 25% when they join the Air Force. These are the finest and best trained and equipped troops on the planet. It costs $20,000 to recruit one, $155,000 for infantry basic training, and $5 million to train a Special Forces service member. So, why, today, are we losing 22 more to suicide, than we lost in combat, in theater, and under fire? Sadly, because the biggest myth in medicine is “there is no treatment for brain injury.” Instead the Veterans Administration researchers publish papers that blame the veteran for either being broken when they joined the military, or, for the “psychological” issue of PTSD, imply that they lack “moral fiber” and need to just “get over it.” When in fact to have PTSD you must have two of the three symptoms of mild traumatic brain injury, an organic injury that has nothing to do with moral fiber. Fortunately, we have two major treatments for brain injury in the United States, one in use since 1937, Hyperbaric Oxygen Therapy (HBOT)[i] and one in use since 1980, Cognitive Rehabilitation[ii]. This author, at the request of Chairman Murtha, Defense Appropriations Committee Chair in the U.S. House in 2008, turned in the “High Altitude Mortality Reduction Program,” (HAMR)[iii] that would, for $15 million, have put four hyperbaric chambers, plus chambers for helicopters, into theater in Afghanistan. HAMR would have demonstrated that with as few as 10 hyperbaric treatments, delivered acutely, we could have achieved a 59% reduction in mortality, and prevented the degradation of our forces due to repeated blast exposure, and repaired these men and women before they came home. Our current crisis would have never happened. Instead, the Army Surgeon General fought the proposal to a standstill. Helicopters were purchased instead of a few hyperbaric chambers. In fact, DoD medicine could easily repair a brain injured veteran for $480 with the 80 HBOT treatment protocol, while still in the service. The VA can do the job for about $4,800. If they are sent to the civilian treatment facilities, the listed Medicare reimbursement rate, which just covers the cost of treatment, is $25,000 in one-time costs for the protocol. Instead, VA and DoD medicine, according to the RAND Report, are spending about $32,000 per year on ineffective medications that have significant side effects. DoD already owns the hyperbaric chambers and has trained personnel to use them. In the place of such rational action, each untreated, current war veteran with traumatic brain injury or Post-Traumatic Stress Disorder, is costing the federal, state and local governments about $60,000 per year if they are not homeless and $100,000 per year if they are homeless. There are over one million casualties whose lives have been significantly affected by these injuries. How effective is HBOT treatment? It results in a 15 point IQ increase, the difference between a high school dropout and a college graduate, and equates to about $20,000 in annual income. It results in a 39% reduction in Post-Concussion Syndrome (sleep disorder, photophobia, headaches and executive function challenges), a 30% reduction in PTSD (the largest of any treatment published), and a 51% reduction in depression. It causes a 50% increase in brain metabolism and a 96% improvement in emotional control. The Israeli’s have replicated the research and built a new $10 million facility in Tel Aviv to start treating 540 patients per day. DoD and VA medicine discount the effect of oxygen on wound healing in the brain and claim it is a “placebo-like effect” or that the positive results are a “statistical anomaly.” In fact, 100% of patients who receive 35 or more treatments experience clinically significant improvement. It is far cheaper to fix the war-injured veteran than to leave them untreated. Unfortunately the federal bureaucracies and the medical agencies with the authority and responsibility for treating these men and women, are perfectly willing to shift the costs of treatment out of their budget onto the veteran, the veteran’s family, or state and local governments. Fortunately, there is a remedy. In 2013, the State of Oklahoma took charge of the federally run veteran homes because of neglect and poor care. This author was asked to create a system to provide effective treatment for brain injury, called the Oklahoma Veteran Recovery Plan. The legal discovery that made this possible, is the fact that under the Veterans Bureau Act of 1921, that created what is now the Veterans Administration, this cost shift of war injuries to the states happened after World War I. Therefore the states responded by requiring that when a state paid for a veterans care, the federal government was required to reimburse. This is the way all state run nursing homes are paid to this day. As a result, using the revolving fund, created by SB1604, “The Oklahoma Veterans Traumatic Brain Injury Treatment and Recovery Act,” when a state pays for HBOT, which is not routinely paid by Tricare or VA Medicine, though they have paid in select cases, the Federal government must reimburse the state. This makes it possible to routinize care and get all of the hospital-based hyperbaric centers to start treating Oklahoma’s veterans. In Oklahoma, the 2013 plan passed both the House and Senate, unanimously, and then was blocked from final passage by one key senator. The following year the current version of the legislation passed, and was signed into law, and is currently in the regulation creation stage. When the author testified before the Texas State Legislature, a member of the Texas State House Appropriations committee told us that the Texas state budget is being broken by all of the untreated veterans that have returned from the war. It was the same in Oklahoma, where this author served as a U.S. House Member’s Appropriations Committee staff member for 10 years, as one of the 32 staff in the Congress that controlled the health care spending in the United States. While serving Congress, the author discovered that, if fully integrated into the medical system, hyperbaric oxygen therapy would reduce the costs and outcomes of surgery by 20%,[iv] virtually eliminate outlier patients in the hospital system, and if applied correctly in the Emergency Room, HBOT implementation will likely cut mandatory spending costs like the prison system, in half in about 10 years. The research has already been done and the implications are clear. Just getting Diabetic Foot Wound Treatment approved by Medicare, which this author helped accomplish, cut the cost of amputation by $348 million, and would have saved $3 billion per year if it had been implemented as Medicare was instructed by the Congress to do. So, it is a real savings in efficiency and effectiveness to deploy effective treatment into the medical system, instead of the current symptom management practices of managed care. Patriot Clinics was born from the fact that despite our successes and public support from the state government for HBOT, veterans were not being treated. The state non-profit corporation was set up, eligible for 501c3 charity status, and modeled after the 90 charity hyperbaric centers in Great Britain, and began treating patients in January of 2014. To date we have treated hundreds of veterans and currently have 60 veterans in active treatment in Oklahoma City, with a second clinic to open in Lawton, Oklahoma (Fort Sill) to begin to start treating 6,000 young veterans there. As of September 14th, we are approaching the delivery of 10,000 hyperbaric treatments, starting with a two person multiplace where we were delivering 600 treatments per month, to the addition of three more treatment berths where we are now doing 1,200 treatments per month. No one is charged for hyperbaric treatment at the Patriot Clinics, though third parties, like workers compensation and automobile carriers, will be billed when appropriate. We exist on charity donations and have to raise as much as $20,000 per month to accomplish the 1,200 treatments. We ask all patients that experience success in treatment, to give us a $10 charitable donation for the future to help offset the costs of their treatment today. Many who have gone back to work, donate much more than that each month. Others do not. We removed every possible barrier, and the goal with a young veteran in crisis is to get them into the chamber within three hours of arriving at the clinic. All brain injured patients are immediately eligible for the full 80 treatment protocol, $25,000 at Medicare payment rates. If we charged someone on VA or Social Security disability just $10 per treatment, they would look at the $800 bill, realize it was an entire month’s income, and walk out the door untreated. Because brain power is a public good, that is an unacceptable outcome. We have even treated a female Native American soldier who was a captive of the Afghan Islamic forces. Compared to the ½ hour it took to get her to move 20 feet into the building, and the inability of our physician to complete a full physical on her, and her fear of all males in the building, today after just 10 hyperbaric treatments, she is reengaged, joking, and volunteering at the clinic. She is no longer afraid of every man, even one of our volunteers with long hair and a very bushy black beard. Anthony’s results of improved mood and cognition and restored family relationships are typical of those who complete their HBOT treatment (and we received the above note after he had completed just 10 treatments). Inconceivably, Anthony’s Company of 160 men has now experienced 7 non-combat deaths after returning home–including one overdose on VA-prescribed pharmaceuticals, and sadly, as of the morning of Saturday, April 25th, 2015, that 7th death in his company, added to the rest of them for his Battalion, is more deaths than they suffered in theater! That is unacceptable. With hyperbaric medicine, and the other integrated therapies we use at the Patriot Clinics, we have the tools to do better for those who served their country, and with your help, we plan to continue doing just that. All veterans, police officers, fire fighters and victims of crime are treated anonymously. 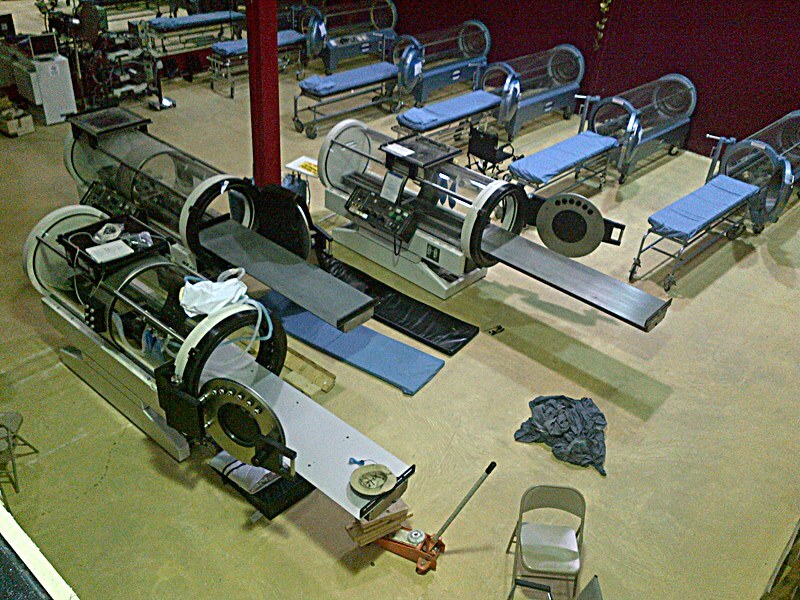 We are and have been the busiest hyperbaric center in the nation, and have seen the routine miracles any of the hyperbaric practitioners that are following the International Hyperbaric Medical Foundation’s National Brain Injury Rescue and Rehabilitation Project’s HBOT 1.5 protocol have experienced. Additionally we have treated quite a number of cancer, wound care and Lyme disease patients. We have done a large number of pre-post-surgery treatments, following the IHMF’s Hospital Outcomes & Profit System’s model, with significant success in improved healing, reduced complications and pain, and great patient satisfaction compared to surgery without the benefit of pre-post hyperbaric treatment. We have removed all possible barriers to brain injured persons receiving hyperbaric oxygen therapy. As an economist, the author considers that maximizing the brain capacity of injured persons is a “public good” just like an aircraft carrier. If the State of Oklahoma is willing to pay $34,000 for every Associates degree granted, and those seeking the degree have a 17% graduation rate, (Bachelor’s degree completion is 34%), and the persons in these programs struggling with brain injury had their brains rebuilt, under the Patriot Clinic model, Associates Degree completions would more than double, and state education savings would be many millions. At Patriot Clinics, we simply got tired of “managed care” managing symptoms. Instead we have implemented “effective care,” using therapies that actually work to improve a patient’s medical condition. We have integrated computerized cognitive rehabilitation with a number of patients, for example, providing the HBOT healing of a brain injury with the CCogRehab[v] capacity expansion (25 IQ points). Experience shows that if you take 100 veterans in transitional living and give them hyperbaric medicine, half will be back to work within 40 treatments, and 80 will be back to work after completing the full protocol. The cost of this treatment is exponentially less than the millions it costs our state each year to leave our wounded veterans untreated, or treated ineffectively. Many injured veterans have lost hope of ever recovering. After years of living with “shattered life” symptoms, they are more than pleased when the headaches disappear, normal sleep returns, the anger issues subside and the ability to think, reason and have healthier family relationships returns. You have the ability to help us reduce the terrible epidemic of 22 veteran suicides a day. Together, let’s help Anthony’s Battalion and others like it lose fewer vets to suicide. The Patriot Clinics has the ability to help. The IHMF stands ready to get funds donated from a state back into that state to foster each state’s veteran recovery plan. We are asking for your partnership in restoring our injured veterans to health by making the donated funds in your state’s Veteran Recovery plan available as soon as possible. You can help restore your state’s suffering and wounded warriors to lives of dignity, purpose, health and peace. At Patriot Clinics we are honoring our pledge to leave no one behind. Join us or another local charity in your state dedicated to getting effective treatment for these wounded men and women. Hyperbaric oxygen treatment has been used to treat brain injuries since 1937, with the most effective HBOT protocol to treat brain injury in use now for nearly 40 years. Brain injury is so endemic in our society that its symptoms are largely unnoticed. Our veterans suffer terribly from brain injuries incurred in warfare today, as well as from PTSD—and HBOT is the only truly effective treatment for these conditions. Hyperbaric medicine can and does reduce those costs—drastically. In the multi-center hyperbaric oxygen study on brain injuries done by OSU and LSU (NBIRR-2), the pre- and post- cognitive and psychological diagnostics demonstrated that 100% of the study participants who completed 35 hyperbaric treatments had clinically significant improvement. There are some who have trouble accepting these results. However, anyone who examines the studies from 1937 onward will see that hyperbaric medicine is extremely well-studied. HBOT is already FDA approved for 14 different conditions, including 3 different types of brain injury and 3 types of chronic, non-healing wounds. We know why and how pressurized oxygen works. Oxygen is essential in 5769 cellular processes, and HBOT activates 8101 genes–most of them involved in inflammation reduction and other healing processes. There is more evidence for the effectiveness of hyperbaric oxygen therapy than ANY other treatment currently used by the VA and DOD. In a recent study published in JAMA, the VA’s own Colonel Miller even admitted that the hyperbaric treated individuals (one group getting 35% more oxygen, while another getting 700% more) did better than anyone treated with the best TBI and PTSD therapies currently used by the DOD and VA.
[i] Developed for treating U.S. Navy Divers in 1937 by CAPT Behnke, and finally adopted for U.S. Navy diving in 1968, after all of the other Navy and Air Forces of the world were already using it. [iii] This proposal will appear on the Patriot Clinic website at www.PatriotClinics.com very shortly. [iv] Cardiovasc Revasc Med. 2010 Jan-Mar;11(1):8-19. [v] Computerized Cognitive Rehabilitation as performed by the TeleTherapy software developed by Cognitive Systems, Inc.